Gemstones violin is made of carved carnelian, jade and tiger eye stones. Each piece is sold with a rosewood display stand and satin box. Gemstones guitar is made of carved carnelian, jade and stones. Each piece is sold with a rosewood display stand and satin box. Natural green jade horse carved out of a whole piece of rough jade rock. Horse is approx. 9" tall & 9.5" long, and 6.3lbs in weight. The horse is carved in traditional Chinese royal style. Wt. 320 grams/11.26 oz. Chinese natural turquoise rock fully polished from Clouds-capped Mountain mines in Hubei China where produces the best turquoise most desired by Chinese high society and the American jewelers. Wt. 1465 grams/51.20 oz. Chinese natural turquoise rock fully polished. 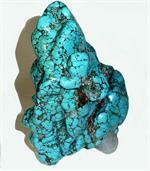 This piece is a rare nice one from the turquoise mines in Hubei China. Ideal gem stone for treasure collection.